Should Utah charter schools be allowed to seize private land? High school is being built despite court denials of charter's bid for a southern access. Josh Aune | Courtesy Neighbors watch as a home owned by Draper's American Preparatory Academy is demolished Friday morning to make way for an emergency access route to the construction site of a new charter high school. Steve Griffin | The Salt Lake Tribune State school board members are divided on whether eminent domain should be used to create a new driveway through this gate at American Preparatory Academy in Draper,Utah Friday June 9, 2017. Charter school access dispute Unable to resolve disputed access on its south side, American Preparatory Academy in Draper is using a residential property that it acquired to open access from the north, which has angered some residents along Election Road. Steve Griffin | The Salt Lake Tribune State school board members are divided on whether eminent domain should be used to create a new driveway through this gate at American Preparatory Academy in Draper,Utah Friday June 9, 2017. 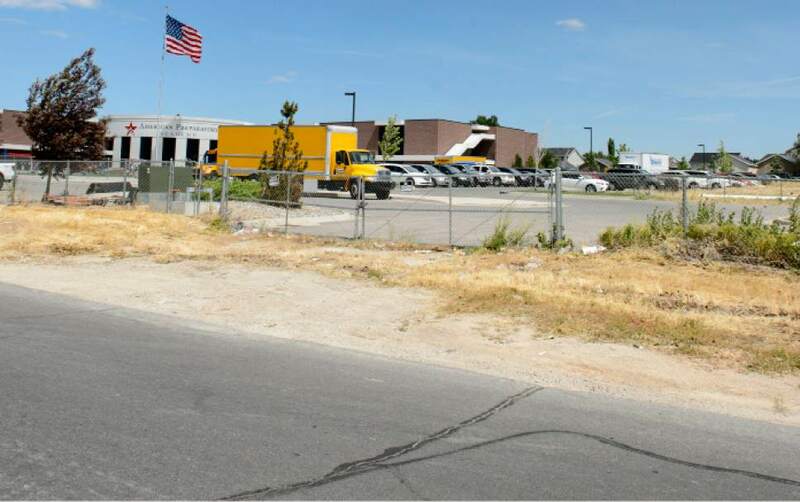 When construction began on a new American Preparatory Academy in January, the charter school lacked required permits from the Utah Board of Education, according to newly obtained school board emails. The project timeline and American Prep&apos;s ongoing and unprecedented quest to seize private land through eminent domain drew sharp critiques from some school board members, expressed in email chains during March and April with subject lines like "APA train wreck in Draper." Beyond the plight of a single school, the so-called "train wreck" has catalyzed a debate over who can condemn property for charter use. "Charter schools sold themselves to Utah as cost-effective alternatives to traditional, neighborhood schools. They were also supposed to be innovative," state school board member Carol Lear wrote March 24. "Bullying neighbors and property owners seems outside of that initial mission." Lear wrote that public and private dollars have been "squandered" by APA administrators, who sued their neighbor, Price Logistics Center Draper, in a yearslong attempt to access a nearby road. APA plans to open a second campus on its Draper property this fall, but the parking lot is blocked from 11950 South by a so-called "grudge strip" owned by developer and former U.S. Ambassador John Price. While school representatives contest the ownership of the land strip, the ensuing dispute left APA functionally landlocked, relying on an easement driveway and, more recently, the purchase and demolition of an adjacent home to allow emergency access through Draper&apos;s Inauguration Park neighborhood. "This willful disregard for the lives of these public school students is breathtaking and really leaves no choice but to take the property to prevent this man [John Price] from putting up an impenetrable fence and endangering their lives," APA founder and former state Charter School Board Chairman Howard Headlee wrote in a March 4 email to charter board members. APA&apos;s drama has spread to include protests by neighbors, pressure by lobbyists and state lawmakers, and infighting among members of the Utah Board of Education. The case also has been a test of Utah&apos;s eminent domain law, which has never been applied to a charter school and fails to specify how property condemnation should be handled for the independent public schools, which are largely overseen by unelected boards. Court rulings have blocked APA administrators from seizing the grudge strip but shed little light on the larger question of what state entity is empowered to act on a charter&apos;s behalf. "This is a case of a pig-headed charter organization (Howard Headlee and APA) breaking rules, intimidating, and continuing to build this school  expecting forgiveness from the developer, the city and others on the back end," Lear wrote to state school board member Kathleen Riebe. Later in the email she added that "Everybody fears Howard Headlee." A &apos;nuclear&apos; option • Emails show that Board of Education members Lear, Riebe and Scott Neilson oppose  or at least are skeptical of  eminent domain being used to give APA access to 11950 South. Part of that opposition appears to stem from what board members see as flawed planning on the part of American Prep&apos;s governing board, Utah Charter Academies. "This school should have had a functioning site plan long before they started building!" Neilson wrote March 31. "I am especially disturbed that a non-elected entity moved to use the power of eminent domain." Utah Charter Academies attempted in 2015 to condemn the grudge strip by its own authority, but 3rd District Judge Su Chon ruled that the nonprofit corporation and unelected body does not qualify as a "board of education" under Utah&apos;s eminent domain law. APA then requested that the state Charter School Board, a governor-appointed subsidiary panel to the Utah Board of Education, intervene and condemn the grudge strip on its behalf. "This must end now, and at this moment your board is the only governing body that can get this back in front of a judge," Headlee wrote March 24 to the charter board. Those board members also were lobbied by Sen. Howard Stephenson, R-Draper, who encouraged them to consider themselves "statutorily independent" from the Utah Board of Education and to remember that charter schools are intended by legislators to be on even footing with their school district counterparts. "Other charter authorizers including school districts and institutions of higher education can exercise the powers of eminent domain on behalf of the charter schools they authorize;" Stephenson wrote March 21, "therefore, it is clear that your independent, statutorily authorized board should be able to protect the children attending the schools you have authorized when it is required." 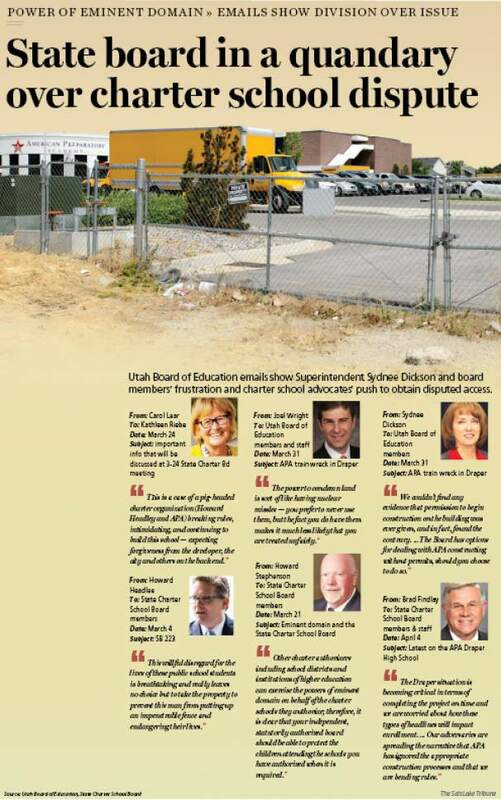 The state Charter School Board declined to step in, but APA&apos;s eminent domain request triggered a flurry of emails between members of the Utah Board of Education and their staff. Lear described the charter board using eminent domain as a "ridiculous notion," due to that board&apos;s advisory role, and criticized APA tactics. "APA is powering through, using political connections and pressure, breaking rules, not following its approved plan  to finish a charter high school," Lear wrote March 23. Other board members were more moderated in their communications, while still hinting at discomfort over the issue. Laura Belnap said the dispute highlights the "sticky" division between the Utah Board of Education and the State Charter School Board, and newly elected member Lisa Cummins requested background information to aid in her role as a liaison between the two boards. Cummins also disclosed to her fellow board members that she was enrolling two of her children at APA. But she emphasized the decision was hers and not influenced by school representatives. "No one approached me," she wrote. But board member Joel Wright, a lawyer who represents APA and formerly served on the state charter board, advocated in support of charter schools having eminent domain power while asking that he be left out of discussions that specifically involve his client school. "The power to condemn land is sort of like having nuclear missiles  you prefer to never use them," Wright wrote March 31, "but the fact you do have them makes it much less likely that you are treated unfairly." Playing politics • In a recent interview, Lear said it&apos;s a "stretch" for even the Utah Board of Education to condemn property for individual schools. Doing so, she said, would create "chaos" for the zoning and planning of municipal and county leaders. She said she doesn&apos;t know who can rightfully condemn land on behalf of charter schools but added that she is sure it is not and should not be the state Charter School Board. "I cannot see the charter board in any other role than advisory to the state Board of Education," she said. It&apos;s a question of Utah property law that has generated many questions and few answers as APA has sought help from any entity that might resolve its plight. "They [APA officials] have not been given eminent domain at this point but Howard Headlee is certainly seeking this," state Superintendent Sydnee Dickson wrote to school board members March 24. "The [state Charter School Board] doesn&apos;t seem to have authority to do so as an authorizer but some are challenging this opinion." She later added that "many eyes are on this and we are aware of the political pressure being exerted." In an interview, Headlee described himself as a school parent and volunteer, insisting that his involvement in the dispute extends only to a brief attempt at negotiating resolutions to the grudge strip access and the school&apos;s construction permitting. "They reached out to me in a panic on the night before [work] was going to be shut down," he said. "My involvement didn&apos;t help much." He said Judge Chon&apos;s ruling suggests the state Charter School Board may be the appropriate entity to condemn Price&apos;s land. And he encouraged that board to join the school&apos;s lawsuit, even if the members doubted their power to do so. "Maybe I&apos;m just a convenient boogeyman," he said. "All I&apos;ve tried to do is resolve it, and I&apos;ve failed miserably  so I&apos;m pretty much done." The legal ambiguity also has generated contradictory statements from Stephenson. After his March 21 email to charter board members, Stephenson participated in an April 5 community meeting at the school and told guests that the Utah Board of Education, not the charter board, is the de facto district office for charter schools. One month later, state Charter School Board members continued to believe that Stephenson considered them to possess eminent domain authority, emails show. "Senator Stephenson was concerned about the satellite campus/expansion issue," charter board vice chairwoman DeLaina Tonks wrote May 22, "but the main thing he wanted to discuss in administrative rules [committee] was eminent domain as he is of the belief that our board has/should have the authority to exercise it." Reached recently by email, Stephenson said he is reluctant to allow individual charter schools to exercise eminent domain and that the authority to condemn land should instead be held by a statewide body like the state Charter School Board or the Utah Board of Education. "In any event," he said, "it needs to be clarified." Deputy state Superintendent Scott Jones said the Utah Board of Education continues to hold the position that the charter school board cannot legally condemn private property. "That&apos;s really the consensus of the board chair and board leadership," he said. Under construction • Between March 30 and April 4, the state school board ordered a halt to construction of APA&apos;s new school campus in Draper. At issue was a temporary driveway, allowing for emergency vehicle access, the school had built through a residential property near the site. 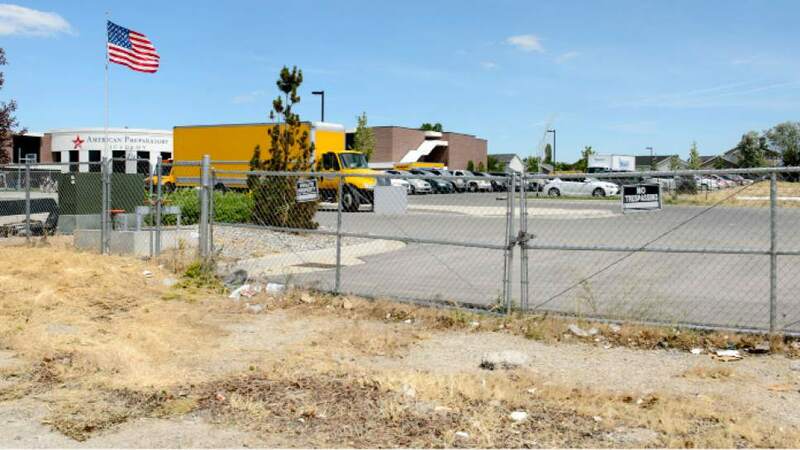 The day the work ban was lifted, Utah Charter Academies Chairman Brad Findlay wrote to the state Charter School Board and again pressed the issue of eminent domain. School administrators had done everything right, he said, but ideological opposition was threatening the opening of a high school campus. "The Draper situation is becoming critical in terms of completing the project on time and we are worried about how these types of headlines will impact enrollment," Findlay wrote April 4. "Our adversaries are spreading the narrative that APA has ignored the appropriate construction processes and that we are bending rules." But school board emails show that long before work was stopped in March, APA had failed to secure the necessary approval to begin construction. Dickson, the state superintendent, wrote March 31 that APA was unable to produce documentation that the state school board had signed off on its plans, a requirement for charter construction. "We couldn&apos;t find any evidence that permission to begin construction on the building was ever given, and in fact, found the contrary," Dickson wrote March 31. "The Board has options for dealing with APA constructing without permits, should you choose to do so." The charter school&apos;s contractor, Ed McDonald, also acknowledged the oversight in a March 31 email to Jenefer Youngfield, construction and facility specialist for the Utah Board of Education. "I was not aware that the USBOE issued a permit until it was brought to my attention in mid-February," McDonald wrote. Findlay said the Draper construction followed the same process and practices as APA&apos;s six existing schools. The missing permits, he said, were never obtained during those previous projects, but construction was allowed to continue. "We proceeded with the exact same approval letters," Findlay said. "I have suppositions, but that would just be speculation." He also questioned the school board&apos;s insistence that APA&apos;s emergency access lane be completed before construction on the high school building, comparing the order to when a residential home and driveway are built. "In this case, we were required to put the driveway in before we built the house," he said. "It made no sense but all of the sudden, for some reason, that&apos;s what happened." Findlay maintains that APA rightfully owns the land along 11950 South and should be granted access. Chon ruled against the school in March, and last week the school&apos;s appeal was denied. Price, the property owner, has declined to comment on the litigation, but his lawyers argue that mixing school and industrial park traffic would be unsafe. "You tell me who&apos;s pigheaded and stubborn in this. Is it the school?" Findlay said. "We&apos;ve totally been stymied by a private developer that simply doesn&apos;t want a public school to get access to a public road." Jones said the board&apos;s requirement that an emergency access be built was due to the fact that an elementary and middle school currently operate adjacent to the construction site. 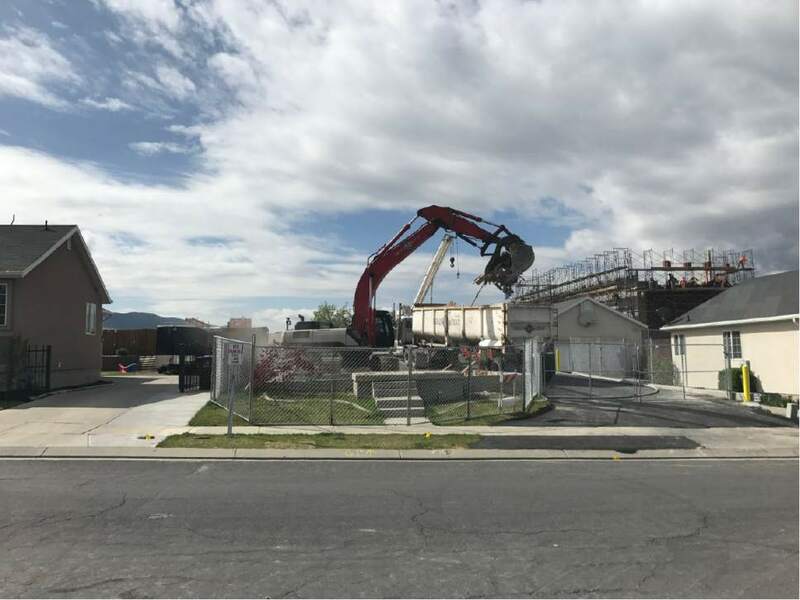 While Utah Charter Academies continues to press the eminent domain issue, Jones said the board&apos;s concerns were resolved by the demolition of a nearby home to create a secondary access point to APA property. But Lear said it is not yet clear the charter school has updated its plans for parking, traffic and vehicle access in anticipation of a high school expansion. "The nature of a high school is so different than a school with nondrivers in it," she said. The school&apos;s current layout, with a single driveway connecting to Lone Peak Parkway, has been a source of frustration for community members as near-daily traffic congestion during the school year clogs roads during drop-off and pickup hours. Homeowners launched a "Shame On APA" website and hung a banner from a nearby property, which led to the school erecting what was described as a "spite fence" to block the banner from view. As recently as early April, some members of the Utah Board of Education advocated for a complete shutdown of school construction until concerns could be resolved. "The people of Draper deserve to be treated justly," Riebe wrote April 5. "The whole plan should go back to review."